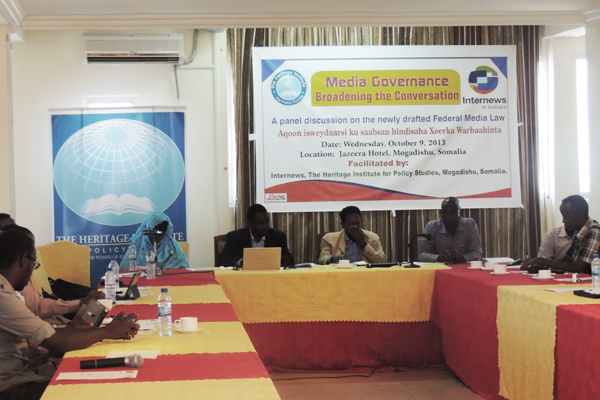 In July this year a Technical Committee was established to review the draft Media Law that the cabinet of the Federal Government of Somalia (FGS) approved. The draft Media Law was widely considered controversial in its scope and possible implications. Local and international media rights groups worried that it would significantly curtail freedom of expression and expose journalists to prosecution. Sustained domestic and international pressure led to the establishment of the Technical Committee with the task to review the 26 articles of the Law, conduct public consultations and civic education and offer amendments to policymakers. As part of the public consultations, the Heritage Institute for Policy Studies (HIPS), in collaboration with InterNews Somalia, organized a special forum on the subject. Key stakeholders, including journalists’ union, independent media houses, senior policymakers and international experts were invited to the three-hour event in Mogadishu. The draft Media Law raised eyebrows among the media community on a number of aspects. 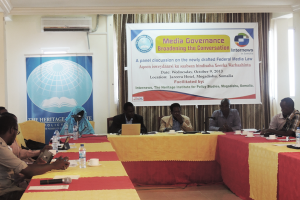 Of particular concern were clauses dealing with media regulation, restrictions on what news outlets could—and could not– report, broad definition of what could be considered offensive to Islam and Somali culture and the establishment of the National Media Council (NMC), a semi-governmental body with substantial oversight. Many participants expressed concern that the draft Media Law and the NMC were state instruments designed to curtail freedom of expression and media’s obligation to hold the government accountable to its citizens. On their part, media owners and journalists conceded that the need to balance between their obligation and the necessity to disseminate accurate news and information. A number of participants voiced deep concerns about an increasing number of media houses abusing the freedom of expression to violate individual, group and even state rights. This forum is one of many public consultations that will take place across the country. The findings of these consultations will inform recommendations that the Technical Committee will submit to the FGS Cabinet for considerations in redrafting the Media Law. This entry was posted in Forum for Ideas and tagged Draft Media Law, Heritage Institute, Heritage Institute for Policy Studies, HIPS, Mogadishu, Somali Media, Somalia. Bookmark the permalink. Trackbacks are closed, but you can post a comment.